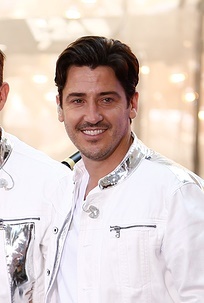 Jonathan Knight is an American singer and real estate developer. He is a member of the boy band New Kids on the Block, along with Joey McIntyre, Donnie Wahlberg, Danny Wood, and his brother Jordan Knight. Jonathan is the son of Canadian parents, Marlene Lenore (Putnam) and William Allan Knight, an Episcopalian minister. His father is from Meaford and his mother is from Dunnville, both in Ontario. Jonathan has U.S. and Canadian citizenship. Jonathan’s maternal grandfather was Floyd Archibald Putman (the son of James Archibald Putman and Florence May Moore). Floyd was born in Dunnville, Haldimand County, Ontario. James was the son of Hiram Putman/Putnam and Mary Charlotte Farr. Florence was the daughter of David Miley Moore and Alice Mary Swayze. Jonathan’s maternal grandmother was Pearl May Johnston (the daughter of William Arthur Johnston and Sarah Lounsbury). Pearl was born in Seneca Township, Haldimand County, Ontario. William was the son of Robert Johnston and Margaret Jane Burgess. Sarah was the daughter of Issac Lounsbury and Barbara Jane Culp. I’m sorry, I just though all member of their band deserved a page of their own. It would have been wierd if there was a major difference between two brothers’ profiles. I’m actually glad you added a page for him, I should have done it in the first place. I also realized the page I made for Carnie Wilson used your info on Brian Wilson and I somehow did not write “Info by Madman” on it, though I usually do if I use info from another page. I’m sure one of the mods can add “Info by Savanna” on this page too.